Just like the MTN, Glo, Airtel and 9mobile welcome back offer, Smile communication has also announced its own welcome back offer for all Smile users who haven't used thier SIM in the last 3 months. 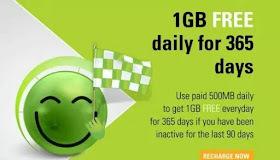 Smile is giving out free 1gb data daily for a year (365 days) to all subscribers who have dumped their SIM for at least three months. This is a total of 365gb free data as welcome back bonus. >> Get your Smile 4G SIM that your haven't used in the last 3months (90 days) or more. >> Subscribe to any Smile data plan of at least 500mb and you will be rewarded with the free daily 1GB data for the next 365 days. You can use the free data to browse stream or even download. It can be used anytime of the day and on any internet enabled device.